Greetings, dear readers! I hope you are having a wonderful day! I had such a great time at the Indie Shop event, and I'll have a blog post up with pictures soon. For today's blog post, I have a review that has been in the works for a little while now. I had the pleasure of chatting with Melissa from Love & Lotus Naturals, and she sent me an assortment of her bath and body products to test out. 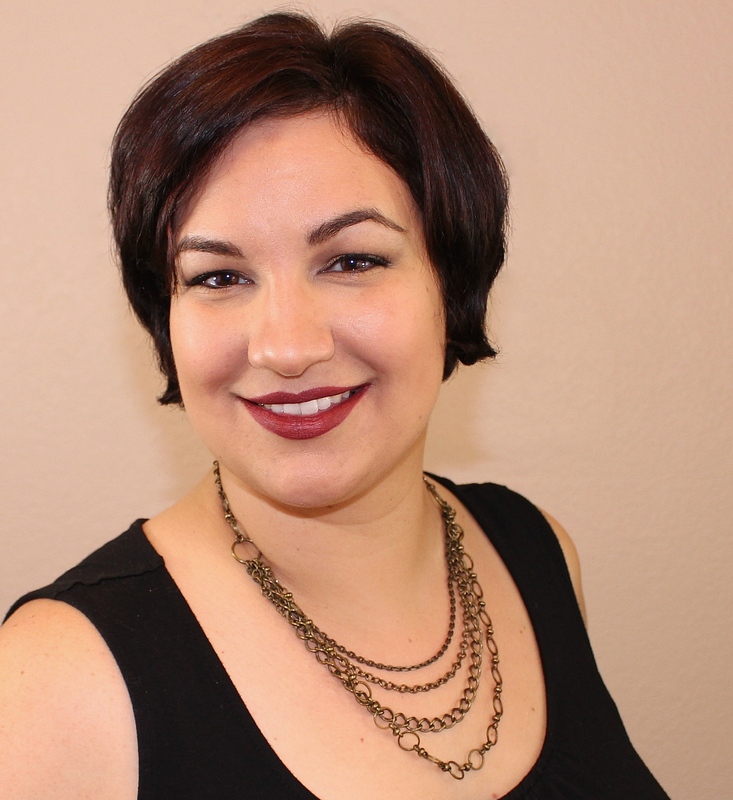 I am so eager to tell you all about the AMAZING products she sells, so let's jump right on in! Ready? Let's do this! While I am generally happy when I receive my packages, I have to admit I am a sucker for pretty packaging. 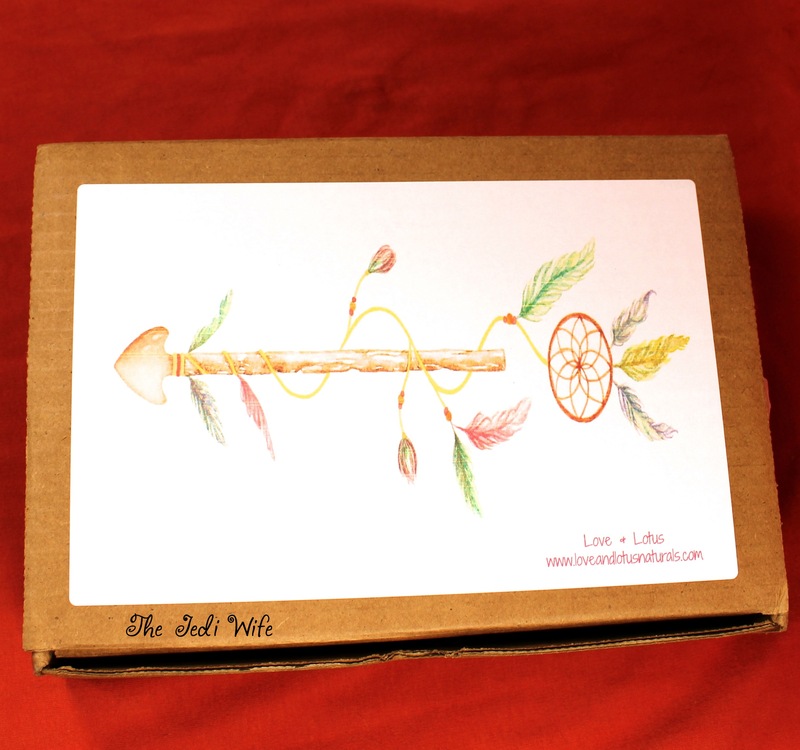 Michelle certainly did not disappoint with this gorgeous box! I love this sticker featuring the arrow and dream catcher! It is such a simple but beautiful touch. I knew when I pulled this box out of it's shipping package that I was in for a fabulous experience. Oh my, look how pretty this is! I actually had a difficult time pulling everything out as this is such a pretty site! 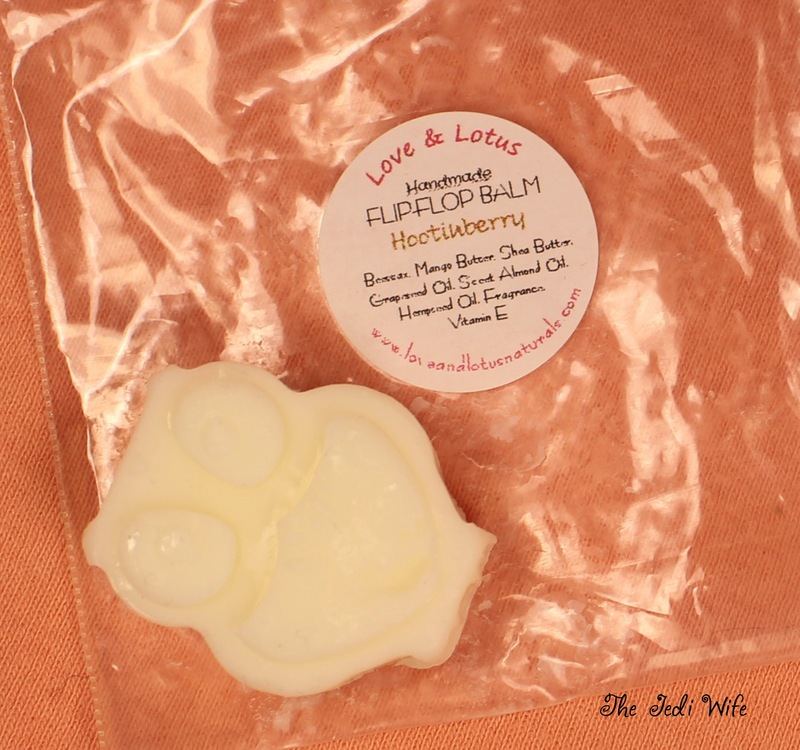 I enjoyed trying out a range of Love & Lotus Natural products; let's check them out in detail. Every single one of these premium high mineral count, naturally made pure salts are in every bag of this Soothing Salt Soak. This is not your typical salt bath. So Indulge yourself, soak your stress away, relax your body, quiet your mind and nourish your skin! Wine optional. 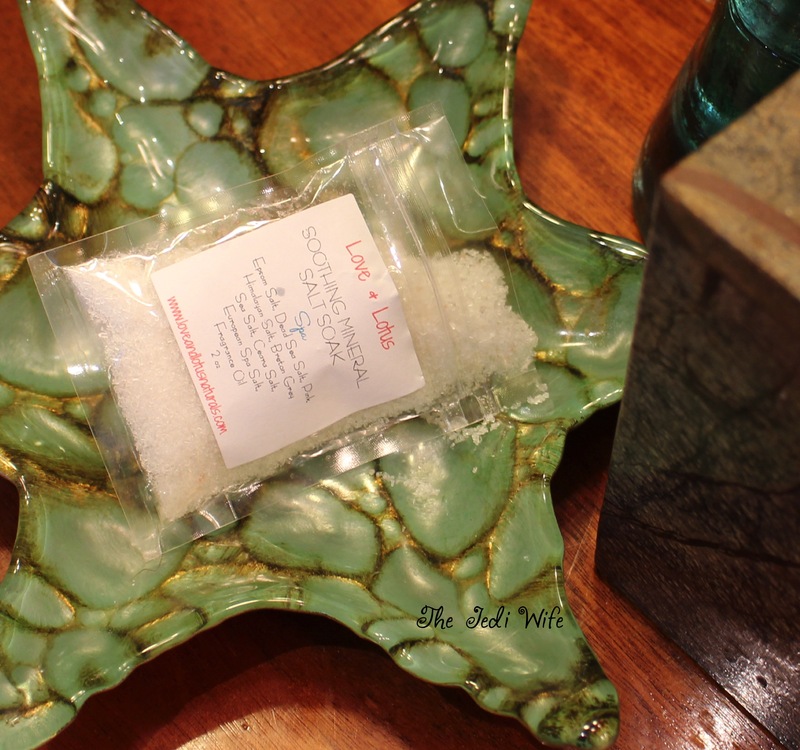 I received two samples of this salt soak: one in Spa scent and the other in Sage, Sweetgrass & Cedar. After chasing my littles around all day long, my body certainly appreciates a soothing soak! I decided to really pamper myself so I turned off the lights, lit a few candles, and poured a bag of salts into the tub. I have to say, it was fantastic! After a nice soak with these salt soaks, both my body and mind were relaxed, and my aching feet and legs felt so much better! I have always tended to enjoy baths with bath balms and bubbles, but these salts have convinced me I seriously need to use mineral salts far more often than I do. I enjoyed both these scents, but if they aren't quite for you, there are several others to choose from. 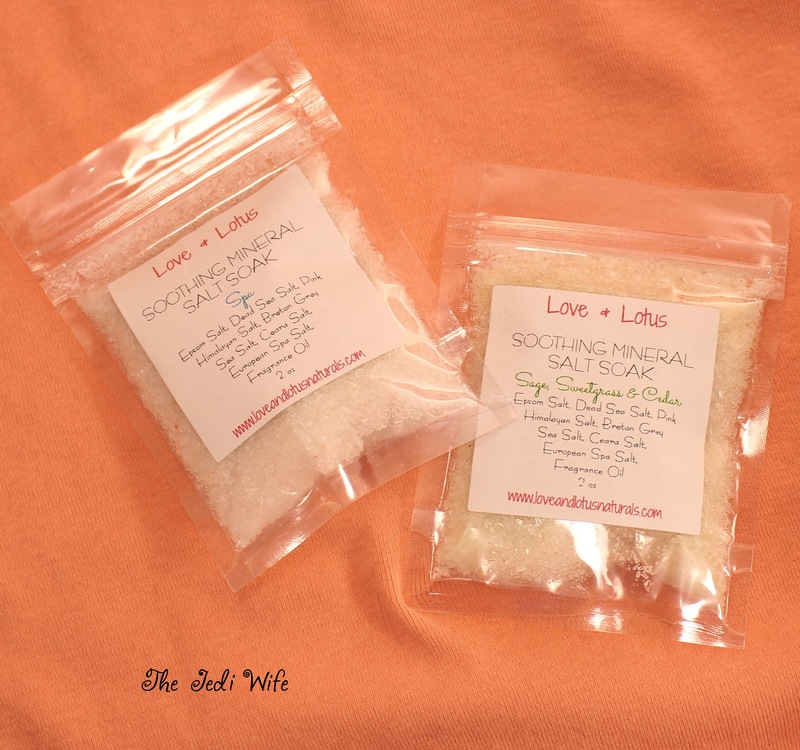 Ingredients: Epsom Salt, Dead Sea Salt, Pink Himalayan Salt, Ceara Salt, Breton Grey Salt, European Spa Salt, Fragrance and or Essential Oils. 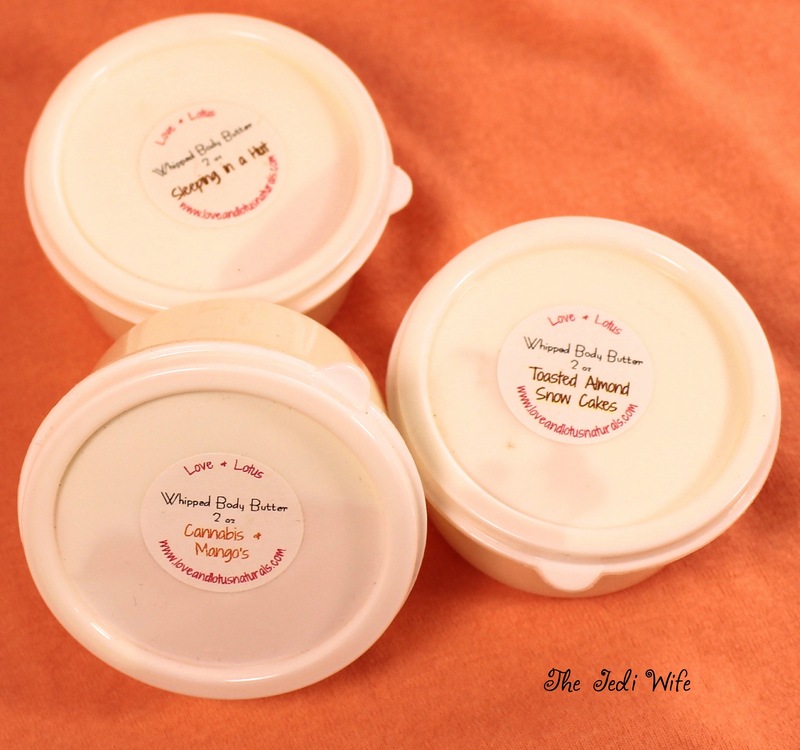 This whipped body butter is packed full of skin loving oils and butters to leave you fully hydrated and moisturized yet light and fluffy enough to let your skin breathe all year round. Now that winter is over, I really wanted to get my skin in better condition for bare arms and legs. Let me just say WOW! I've used a range of body butters over the years, but none have impressed me anywhere near as much as this one from Love & Lotus Naturals! It packs quite a punch to moisturize your skin, and yet it doesn't leave a heavy or greasy feeling after using it. As if that wasn't fabulous enough, the scents are delicious! Serendipity is a new scent for this spring and summer, and oh my, it is divine! It is described as having soft notes of citrus, vanilla, orange, and wild coconuts; this scent is made for me! I also got to try out Sleeping in a Hut, Cannabis & Mangos and Toasted Almond Snow Cakes. Toasted Almond Snow Cakes is a little on the sweeter side than I normally prefer, but it is still quite nice. There are several other scent options available for the crazy cats out there that just aren't feeling these ones. Tons of fluffy bubbles, shea butter, coconut oil, moisturizing oils and sugar gently exfoliates and leaves skin feeling soft and clean. Are you tired of me raving yet? I hope not because I'm going to keep at it! I always like to use scrubs on my skin, but many of the ones I use are meant to be used in addition to lathering up with soap. As a mom with two littles at home, my showers tend to be rushed so I don't get to enjoy them often. I am so excited to have a product that both cleans and gently exfoliates the skin! 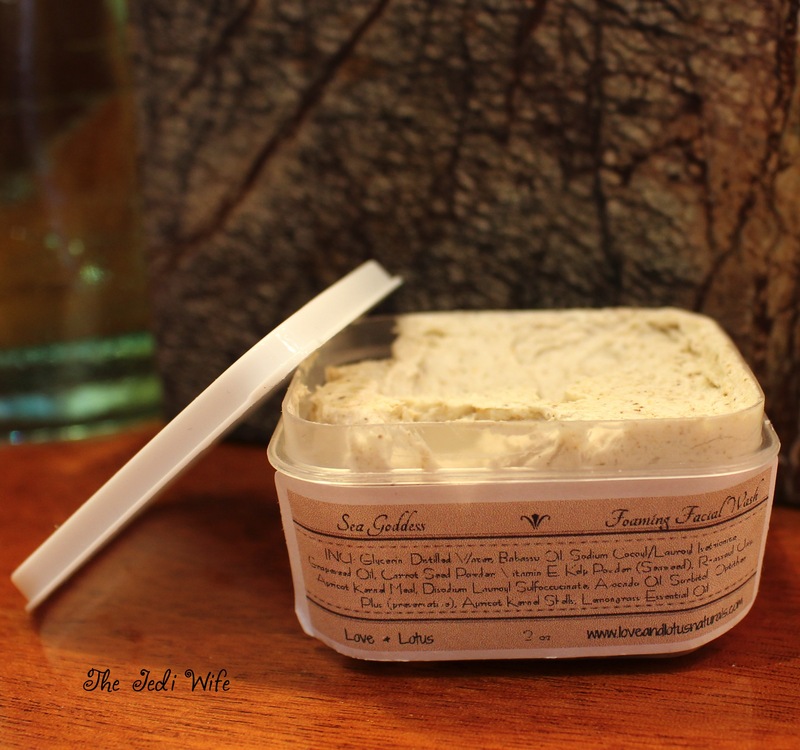 It is so creamy and luxurious, and I don't think I have ever felt so glamorous from a soap or a scrub product before! It is the bees knees, and the scent! I've always though of myself as more of a Pacific Island girl, but I am totally down for visiting the Caribbean if this Caribbean Island scent is something I can expect there! Again there are other scent options available if tropical scents aren't quite your jam. Made for maturing skin to cleanse, remove dirt and excess oil while gently polishing away impurities. ​Use Daily, morning and night. Scoop a dime size amount onto fingertips, add water and wash face and neck area with circular, upward motions avoiding the eye area. Rinse completely and pat dry. Follow up with SEA Goddess Daily Structure Serum and SEA Goddess Daily Complexion Cream or SEA Goddess Nightly Moisture Pack. I was a little apprehensive when I received this particular sample. While the rest of my skin is not, my face is incredibly sensitive, and I have found a lot of products on the market are too harsh and turn me into a bright red lobster with a single use. Far too often, people think that being a beauty blogger is easy, but sometimes we end up having to test products "for science" that we normally are apprehensive about. That being said, I still wanted to give this face wash a fair chance and to share my experience with it. Because my face is so sensitive in general, and I have already found I cannot exfoliate via mechanical means daily, I instead used this foaming facial wash once about every three days. I actually quite liked it! I tend to avoid products that contain apricot kernel shells as I find them to be far too abrasive on skin, but the Sea Goddess Foaming Facial Wash has a thicker consistency in general that kept the apricot kernel shells from being too harsh on my skin. My face felt fresh, clean, and so soft with each use, and I am definitely going to be keeping this baby as part of my beauty routine! 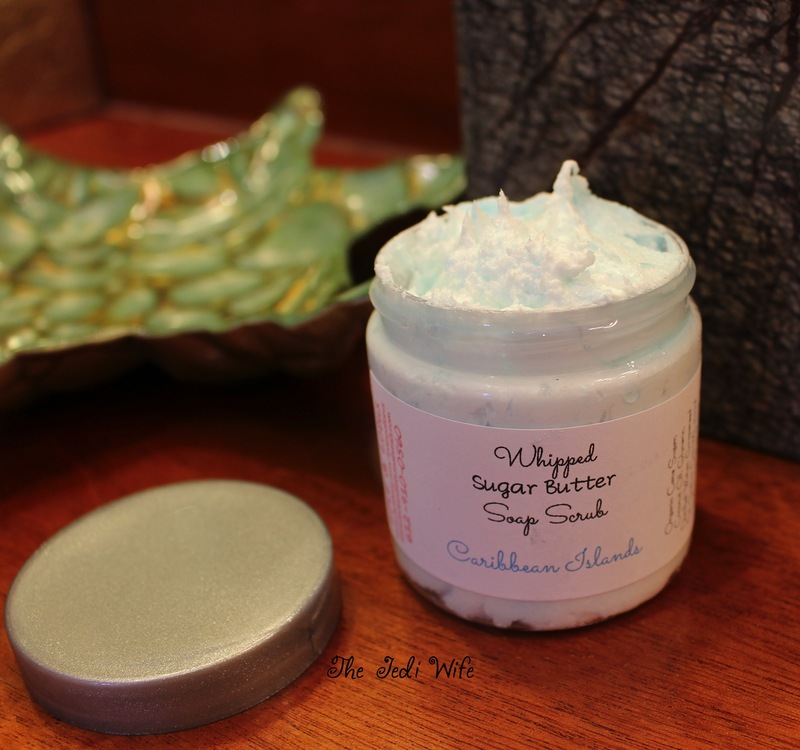 Whipped Superfine Luxe Salt Scrub!! The salt literally dissolves on your skin. If you are looking for a great soft exfoliator packed with skin loving oils and butters, then you will LOVE this scrub. Made with Generous amounts of Organic Shea Butter, Apricot Kernel Oil, Coconut Oil, Safflower Seed Oil, Sesame Seed Oil, Jojoba Seed Oil, Sunflower Seed Oil, Olive Oil, Vitamins E & A, Epsom Salt, Dead Sea Salt, Pink Himalayan Salt, Sonoma Spa Salt, Breton Grey Sea Salt, Ceara Salt and European Spa Salt. Gently exfoliates dry dead skin away while leaving skin soft. smooth and shiny. 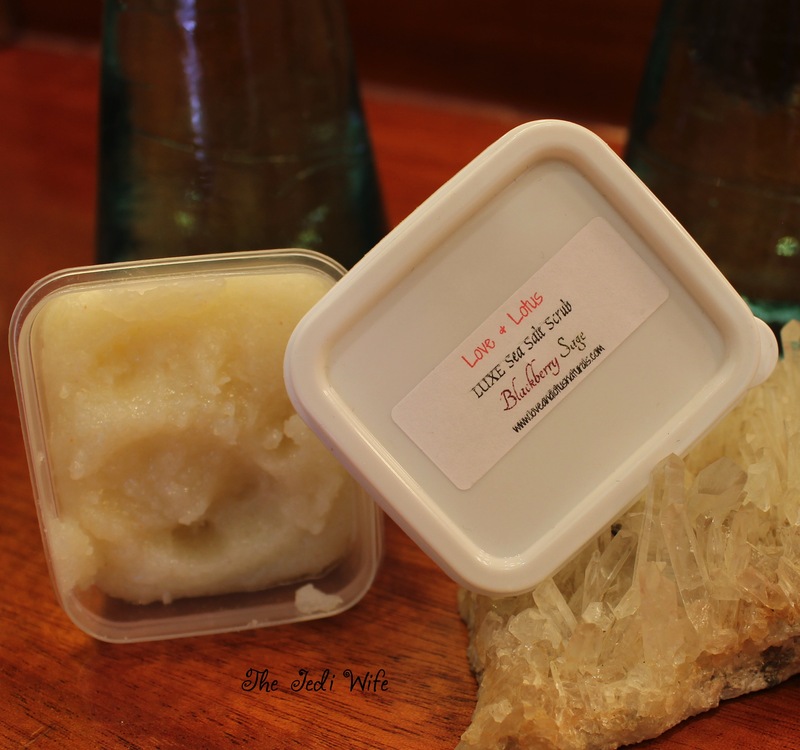 I had the pleasure of testing out a second scrub from Love & Lotus naturals. The LUXE Sea Salt Scrub is more like the scrubs I've used in the past after lathering up with soap. This particular product is more moisturizing than others I've used, and I found that if I'm rushing to get dressed post-shower, I don't have to worry about my skin feeling dry if I don't get to lotion up afterwards. My sample was scented with Blueberry Sage, and it is a wonderful scent option if you like a little fruity but not too sweet scents. I personally love fruit plus herb-type smells a lot, so this one was a big hit for me as well. How cute is this balm?!? I was particularly eager to try this product as I was blessed with my father's gross dry-feet genetics. I will spare you the details, but let's just say my feet get disgustingly dry no matter what I use on them or how I soak them. I used this little balm every night on my feet before covering with socks and going to bed, and I must say, I'm impressed. The solid lotion bar melted nicely against my skin, and my feet aren't anywhere near as badly cracked as they were. I definitely need to pick up more so I can get my feet looking fabulous for the first time ever! A completely solid lotion bar. Weighing in at 2 solid ounces of Locally Sourced Beeswax, Organic Mango Butter, Shea Butter, Hempseed Oil, Sweet Almond Oil, Grapeseed Oil and Vitamin E! This is heavy duty for dry cracked elbows, heels, knuckles and anything that needs intense hydration. Summer is coming, are your feet READY? This post serves as a taste of the skin pampering products you can choose from from Love & Lotus Naturals, and I whole-heartedly recommend every single one! I love that I could feel pampered and let my mind relax and enjoy with the wonderful scents of each of these products, and I am definitely going to be picking up more of these! If you want your skin and feet to be summer-ready, head over to the Love & Lotus Naturals shop located here and pick up these decadent products. Trust me, your skin and nose will thank you! What products appeal to you the most? Is there any on your must-buy list? I'd love to hear from you! Everything looks so beautiful! I love hearing about new-to-me bath and body brands! There products all sound very nice-- especially the body butter and the soap scrub! Wow that is a great haul, all of the products look amazing!! The whipped body butter and the soap scrub sound lovely. I'm heading over to their site to check them out right now! 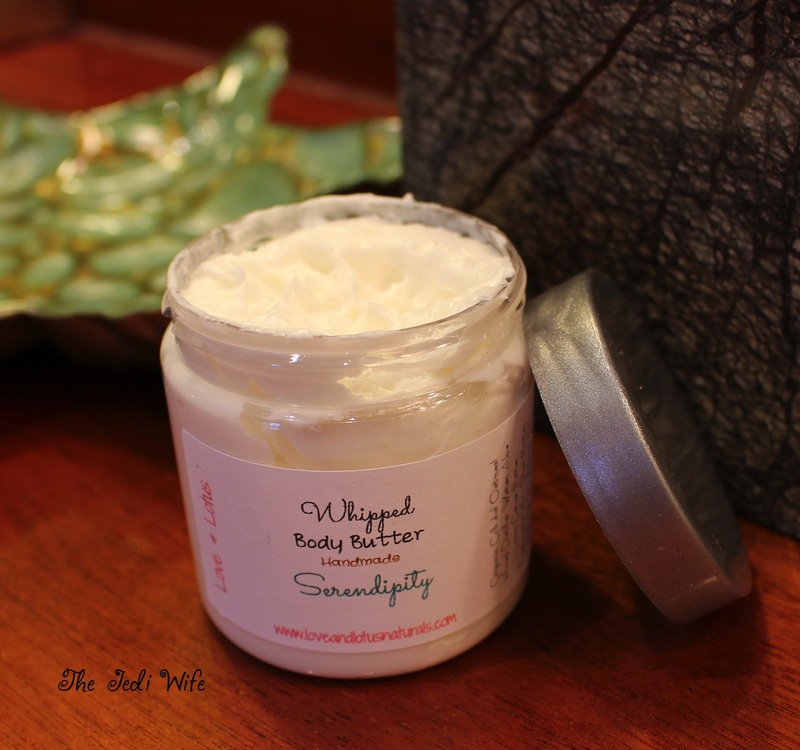 The whipped body butter is definitely my favorite item! I use body butters on the daily. Awwwww!!! I need these products in my life!